Pistachio and chocolate come together in this layer cake. Not only are the flavors complementary, the colors in the cake and buttercream also provide a pleasing visual contrast in each slice! Makes one 9" three layer cake. Preheat the oven to 350℉. Grease and line three 9" pans and set aside. Sift the cake flour and baking powder 2 times and set aside. Whisk the oil, egg yolks, and water together. Add salt and 1 cup sugar and mix until combined. Add the dry ingredients to the liquids, scraping the bowl a couple of times, until the mixture is completely combined and no bits of flour show. In a clean bowl, whip the egg whites and the cream of tartar to a very soft peak. Slowly rain in the remaining sugar and whip to a medium peak. Gently fold the meringue into the cake batter in thirds until combined. Pour a third of the batter into one prepared 9” pan. Add Pistachio Extract to the remaining batter then divide evenly between the last two pans. Bake for 20-25 minutes. Let cool completely, then wrap and chill overnight. In a heat-proof bowl, whisk the egg whites and sugar together until combined. Over a double boiler, heat the mixture on medium-low, whisking, until the temperature reaches 120℉ and the sugar has dissolved. Pour the mixture into a mixer bowl and whip with a whisk attachment until it is cool. Add the room temperature butter a few tablespoons at a time and whip until smooth and creamy. In a separate bowl, mix 4½ cups Swiss Buttercream and Pistachio Butter Artisan until combined. Set aside. In another bowl, mix 2 cups Swiss Buttercream and Chocolate Fudge Brownie Artisan until smooth. Set aside. Remove the paper from the bottoms of each layer of cake, then remove the brown crumb by gently rubbing the top and sides. Place one of the Pistachio Cake layers onto a cardboard round and secure the cardboard round onto a cake stand with a small amount of buttercream. Pipe or scoop about 2 cups of Pistachio Buttercream onto the bottom layer of Pistachio Cake layer and smooth. Lay the white cake onto the Pistachio Buttercream. Pipe or scoop the Chocolate Buttercream onto the White Cake layer and smooth. Lay the second Pistachio Cake onto the Chocolate Buttercream. Wrap and chill the cake for 2 hours or overnight. 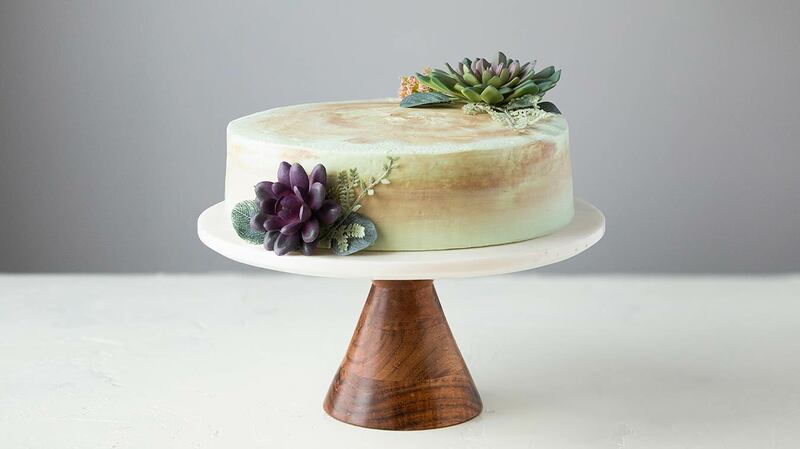 Frost the cake with Pistachio Buttercream and serve. Just want the buttercream? Here's our Swiss Buttercream recipe! Buttercream can be kept at room temperature for 4-5 days if the room is not too warm, or refrigerated for two weeks. Whip before using. If chilled, bring the buttercream to room temperature, then whip for a few minutes until it is creamy and soft enough to spread. 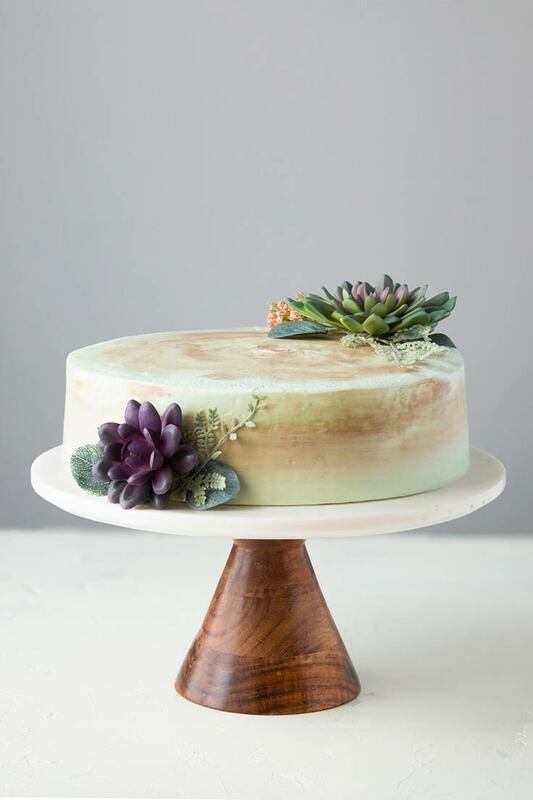 For a marbled effect, save a little Chocolate Buttercream and smear some on miscellaneous areas of the top and sides of the cake and smooth into the Pistachio Buttercream. The inspiration for this cake came from Martha Stewart's Baking Handbook.